The Montana Department of Transportation is improving traffic operations and safety for the Lincoln Road corridor from North Montana Avenue through the Interstate 15 Lincoln Road interchange. 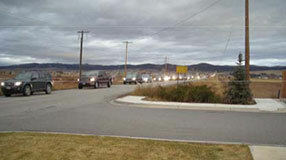 The project is located approximately six miles north of Helena. The north valley outside of Helena has experienced rapid growth in recent years due in part to development activity and changes in land use. Traffic volumes have been increasing rapidly near the I-15 Lincoln Road Interchange. The area is currently experiencing heavy vehicle congestion during the peak hours and traffic is expected to more than double over the next 20 years due to continued development. If remained unchanged, increasing vehicle delay and safety issues are likely to compound. In addition, the project will address the large number and type of intersection-related crashes occurring in this area. From 2003 until 2013 a total of 59 crashes occurred within the project area. A majority of crashes occurring in the corridor involved more than one vehicle and were a rear end or right-angle collision. 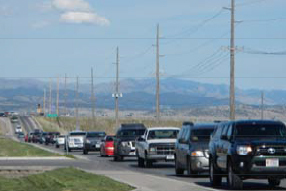 In 2013, MDT began a traffic study to identify and evaluate potential traffic safety and operation improvements at the intersections on Lincoln Road at Montana Avenue and I-15. The traffic study identified and evaluated several intersection improvement options. MDT presented traffic signal and roundabout improvement options to the public in November 2014. Based on public input and additional engineering analysis, MDT identified a preferred alternative and concept design. The preferred alternative was presented to the public in June 2017. The alternatives identified in the study are intended to be implementable in the short-term and do not include full reconstruction of the Lincoln Interchange or the Lincoln Road corridor. Potential barriers and constraints to project development are important to help determine the feasibility of developing the alternatives. A single-lane roundabout with a westbound right-turn bypass lane from Lincoln Road onto North Montana Avenue. The bypass lane will address the high amount of westbound to northbound right-turn movements during the evening rush hour. An additional lane on to the I-15 southbound on-ramp lane. A westbound left-turn from Lincoln road onto the I-15 southbound on-ramp. An eastbound right-turn bypass lane from Lincoln Road onto the southbound I-15 ramp. The right-turn bypass lane will reduce the stacking of traffic on Lincoln Road during morning rush hour. A single-lane roundabout with a westbound right-turn bypass lane. The bypass lane will increase the capacity of the northbound off-ramp to reduce stacking on I-15 during the evening rush hour. MDT considered several options to best serve motorists at these intersections including traffic signals. After evaluation, MDT determined that a roundabout is the safest way to efficiently control traffic at the intersections. Roundabouts have been shown to achieve up to a 90% reduction in fatal collisions over stoplights or stop signs. Improved efficiency and smoother traffic flow. Increased safety due to a reduction of conflict points and a reduced speed throughout the intersection. Up to an 89% reduction in delays and a 56% reduction in stops. A 40% reduction in pedestrian collisions.